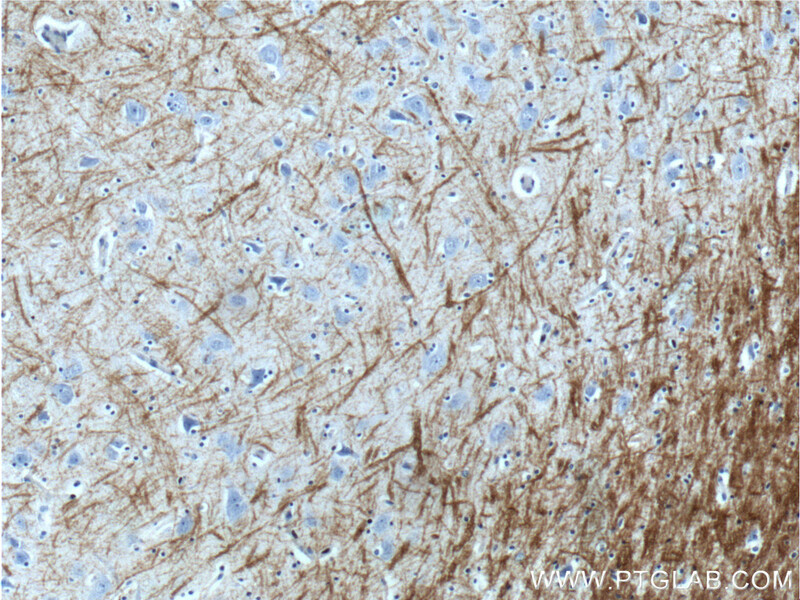 Immunohistochemistry of paraffin-embedded human brain tissue slide using 10458-1-AP( Myelin basic protein antibody at dilution of 1:200 (under 10x lens). 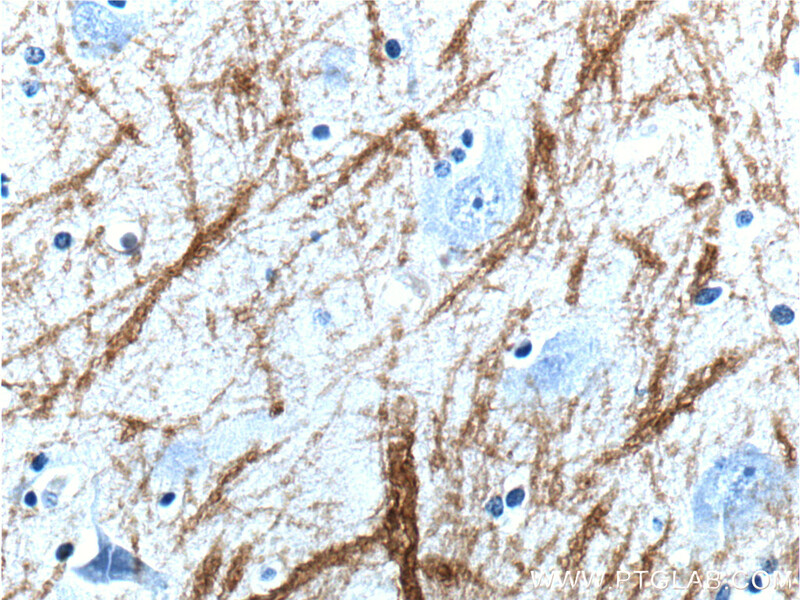 Immunohistochemistry of paraffin-embedded human brain tissue slide using 10458-1-AP( Myelin basic protein antibody at dilution of 1:200 (under 40x lens). MBP belongs to the myelin basic protein family. The classic group of MBP isoforms (isoform 4-isoform 14) are the most abundant protein components of the myelin membrane in the CNS. They have a role in both its formation and stabilization. The smaller isoforms might have an important role in remyelination of denuded axons in multiple sclerosis. The non-classic group of MBP isoforms (isoform 1-isoform 3/Golli-MBPs) may preferentially have a role in the early developing brain long before myelination, maybe as components of transcriptional complexes, and may also be involved in signaling pathways in T-cells and neural cells. MBP has six isoforms. Catalog#10458-1-AP is capable of recognizing multiple isoforms of MBP. Methylene blue alleviates experimental autoimmune encephalomyelitis by modulating AMPK/SIRT1 signaling pathway and Th17/Treg immune response. Protective Effect of 17β-Estradiol Upon Hippocampal Spine Density and Cognitive Function in an Animal Model of Vascular Dementia. Structural and visual functional deficits in a rat model of neuromyelitis optica spectrum disorders related optic neuritis. Mesenchymal Stem Cell-Derived Exosomes Reduce A1 Astrocytes via Downregulation of Phosphorylated NFκB P65 Subunit in Spinal Cord Injury. 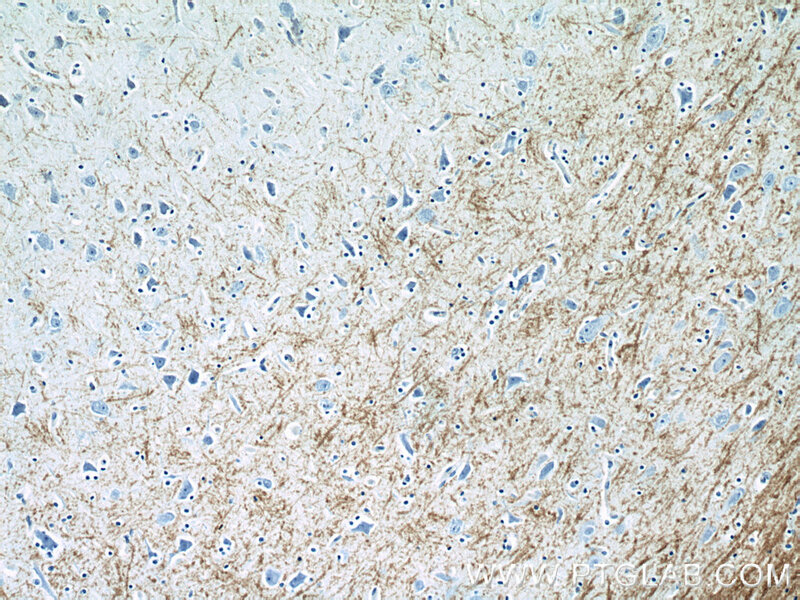 Immunohistochemistry of paraffin-embedded human gliomas tissue slide using 10458-1-AP( Myelin basic protein antibody at dilution of 1:200 (under 10x lens). 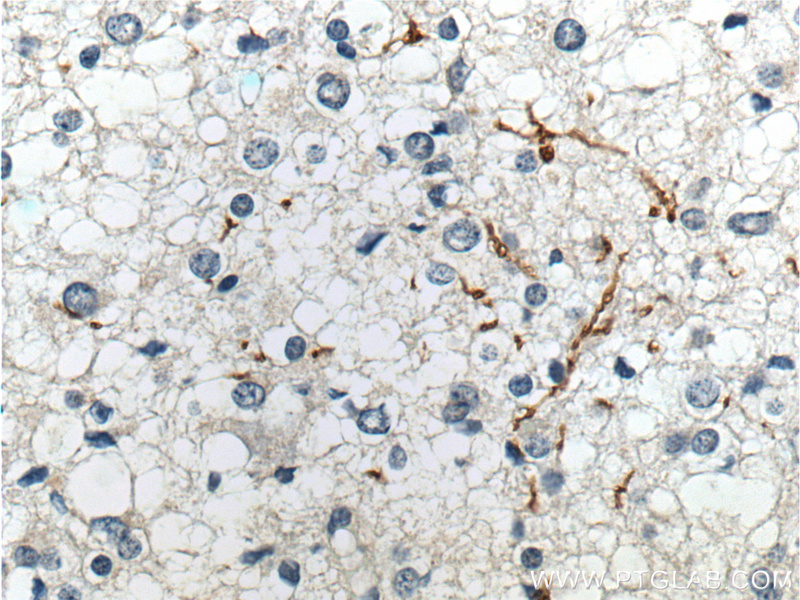 Immunohistochemistry of paraffin-embedded human gliomas tissue slide using 10458-1-AP( Myelin basic protein antibody at dilution of 1:200 (under 40x lens).